This article is about the fruit of Annona squamosa. For the plant which bears this fruit,, see Annona squamosa. "Pinha" redirects here. For Cape Verdean footballer, see Pinha (footballer). The sugar-apple, or sweetsop, is the fruit of Annona squamosa, the most widely grown species of Annona and a native of the tropical Americas and West Indies. The Spanish traders of Manila galleons brought it to Asia, where its old Mexican name ate may still be found in Bengali ata, Nepalese aati, Sinhalese mati anoda, Burmese awzar thee, Indonesia “ Srikaya”’ and atis in the Philippines. It is also known as sitaphal in India and Shareefa in Pakistan and in the Philippines and in Australia. The name is also used in Portuguese as ata. The fruit is spherical-conical, 5–10 cm (2.0–3.9 in) in diameter and 6–10 cm (2.4–3.9 in) long, and weighing 100–240 g (3.5–8.5 oz), with a thick rind composed of knobby segments. The color is typically pale green through blue-green, with a deep pink blush in certain varieties, and typically has a bloom. It is unique among Annona fruits in being segmented, and the segments tend to separate when ripe, exposing the interior. The flesh is fragrant and sweet, creamy white through light yellow, and resembles and tastes like custard. It is found adhering to 13-to-16-millimetre-long (0.51 to 0.63 in) seeds forming individual segments arranged in a single layer around a conical core. It is soft, slightly grainy, and slippery. The hard, shiny seeds may number 20–40 or more per fruit and have a brown to black coat, although varieties exist that are almost seedless. There are also new varieties being developed in Taiwan. The atemoya or "pineapple sugar-apple," a hybrid between the sugar-apple and the cherimoya, is popular in Taiwan, although it was first developed in the US in 1908. The fruit is similar in sweetness to the sugar-apple but has a very different taste. As its name suggests, it tastes like pineapple. As a result of its widespread cultivation, many local names have developed for the fruit. 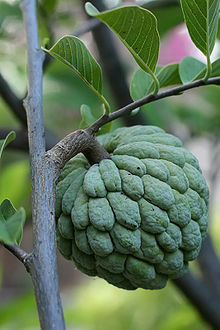 In English, it is most widely known as a sugar apple or sweetsop as well as a custard apple, especially in India and Australia (custard apple also refers to Annona reticulata, a closely related species). In Hispanic America, regional names include anón, anón de azucar, anona blanca, fruta do conde, cachiman, saramuyo, riñon,grenadilla(little grenade) and many others. In Arabic, it is called قشطة (qishta / ishta / ashta), the translation being "cream". In Assamese, it is called Atlos or অাতলচ. Its name in Burmese is ဩဇာသီး or aawză tē. In Djibouti, it is called aat or aag in Somali. In Ethiopia, it is called Gishta (ጊሽጣ) in Amharic. In Greece, it is called γλυκόμηλο (sweet apple). In Hong Kong, it is called foreign lychee (番鬼荔枝). In Telugu: sita phalamu (సీతా ఫలము). in Japan, it is called shakatou (釈迦頭, head of Shakyamuni). In Nepal, it is called "aati" as well as "saripha" (सरीफा). In Sri Lanka, it is called "Anoda" or "Katu Atha" in Sinhalese, "Annamunnaa" (அன்னமுன்னா) in Tamil. In Taiwan, it is called sakya (Chinese: 釋迦; pinyin: shìjiā; Taiwanese: sek-khia, sek-kia) because one cultivar resembles the top part of Shakyamuni's (釋迦牟尼) head. In Thailand, it is called noi-na (น้อยหน่า). In Vietnam, it is called mãng cầu ta or na. In Yemen, it is called Khirmish (خرمش). In Oman, it is called Sa'fal (سعفل). Sugar-apple is high in energy, an excellent source of vitamin C and manganese, a good source of thiamine and vitamin B6, and provides vitamin B2, B3 B5, B9, iron, magnesium, phosphorus and potassium in fair quantities. A Philippine company produces sugar apple wine. The sugar apple readily breaks open when ripe. A deconstruction of a sugar apple, showing a lobe of fruit and pulpy segments with seeds. ^ a b Morton, Julia (1987). "Annona squamosa". Fruits of warm climates. p. 69. Retrieved 6 March 2013. ^ "Annona squamosa". AgroForestryTree Database. Archived from the original on 14 March 2007. Retrieved 16 September 2013. ^ Bernd Nowak, Bettina Schulz: Taschenlexikon tropischer Nutzpflanzen und ihrer Früchte. Quelle&Meyer, Wiebelsheim 2009, ISBN 978-3-494-01455-5, p. 57–59. ^ "Benefits of Custard apple". 22 December 2014. Wikimedia Commons has media related to Annona squamosa. Wikisource has the text of a 1911 Encyclopædia Britannica article about Sugar-apple. "Annona squamosa". Germplasm Resources Information Network (GRIN). Agricultural Research Service (ARS), United States Department of Agriculture (USDA).